The Black Perigord, named after the black oak forest, largely spread across the valleys of the Vezere and the Dordogne, will seduce you for centuries old history. Visits to Castles and bastides (medieval fortified villages) in varied landscapes offer riders memorable sights of this area as well as numerous culinary pleasures the area has many beautiful villages, magnificent castles and impressive cave systems. In the Dordogne are the picturesque villages of Beynac, Castelnaud-la-Chapelle, La Roche Gageac, Domme and Sarlat. A little further south is the most beautiful village of Belves. Along this same stretch of river are the magnificent castles of Beynac, Castelnaud and Les Milandes, as well the caves at Domme, and the troglodyte dwellings under the main square of Belves. There are so many wonderful sights to explore both on horseback and on foot. 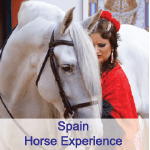 Riding horses between these villages and castles enables you to step back in time and follow medieval tracks and forest pathways as you are seduced by the landscapes and history of the area. The Perigord is also famous for its food, particularly duck and goose products such as confit de canard and foie gras, as well as the infamous black truffles. Both red and white Bergerac and Monbazillac wines are produced in the region, so lovers of both food and wine will not be disappointed. Explore the Castles and bastides (medieval fortified villages) of the Black Perigold with varied landscapes on this riding holiday. Visit the beautiful city of Sarlat and savour delicious french food and wine. Meet at Lalinde train station later in the afternoon and you will be transferred as a group to your B&B. If you have your own transport then you are also welcomed at the B&B in the late afternoon. After breakfast, approx.10:30am, you are introduced to the horses at Chateau de Bannes (a 15th-century private castle). Set off riding through Lalinde’s bastide and follow the canal towards the village of Mauzac which is situated on the right bank of the Dordogne. Enjoy a picnic lunch and the continue to the ancient fishing port of Limeuil. Dinner and overnight in a B&B or hotel. After crossing the forest on horseback, enjoy a picnic lunch near the village of St Cyprien on the edge of the Dordogne. In the afternoon,we take the direction of Castelnaud-la-Chapelle by a medieval footpath from the Castle of Tayac. We leave the horses overnight in the valley of the Ceou. Dinner and overnight in a B&B or hotel. After breakfast you will have time to visit Castelnaud-la-Chapelle’s castle (12th century) and its museum – the castle offers magnificent views across the Beynac, Marquessac and La Roche Gageac. Today’s ride takes you from the Ceou valley to the Dordogne valley where a picnic lunch is waiting for you at the base of a windmill in the Domme Bastide. Either before or after lunch you can visit this royal Bastide from the 13th century. You will enjoy the beautiful views of the Dordogne valley from this medieval village before riding to Vitrac, where the horses overnight. We are then transferred to the well-preserved medieval city of Sarlat for dinner and to overnight. We ride only in the morning today and go through Sarlat before stopping at the Campagnac Castle for a picnic. There is no riding this afternoon and you are free to explore the splendid city of Sarlat. Sarlat is the capital of the Black Perigord region and is considered one of the most beautiful cities in Europe with its stunning architecture, art and history. Dinner and overnight in a B&B or hotel. The path we follow this morning takes us towards Meyrals which offers the chance to see the Puymartin Castle, which was first built in the 12th century then destroyed in the 14th century before being rebuilt in the 15th century. You will have a chance to visit the Castle. Picnic at the foot of Meyrals church. In the afternoon we join Audrix which offers a magnificent panorama of the valley of Vezere. Dinner and night at B&B or hotel. The final day of riding, we go down to the Vezere Valley to join Limeuil. We ride along the Dordogne river towards Cadouin, where we stop for a picnic near the 12th-century Abbey with time to visit the Abbey after lunch. Continue through the Bessede forest which is the most important forest in the Perigord. Take time to explore the village of Moliere’s with its 12th-century Bastide, before returning to Bannes castle. Final dinner and night in a B&B or hotel. This morning you will be transferred as a group to Lalinde or Bergerac after breakfast. Cost: €1630.00 euros. (Please contact us for the Australian dollar conversion. We use the ANZ bank sell rate for our conversion). Single supplement €360.00. Please advise when booking. Lalinde Train station or Bergerac Airport.